The Baader Hyperion Digital T-adapter # HTA54/T-2 permits direct coupling of any T-threaded camera or accessory to Baader's old (discontinued) Mark II Hyperion eyepieces. This adapter attaches to the M54 thread of the Mark-II Hyperion 8-24mm Zoom. The Mark-II eyepiece version was discontinued in mid-2010, but we still offer this adapter for the many users who own the Mark-II model. 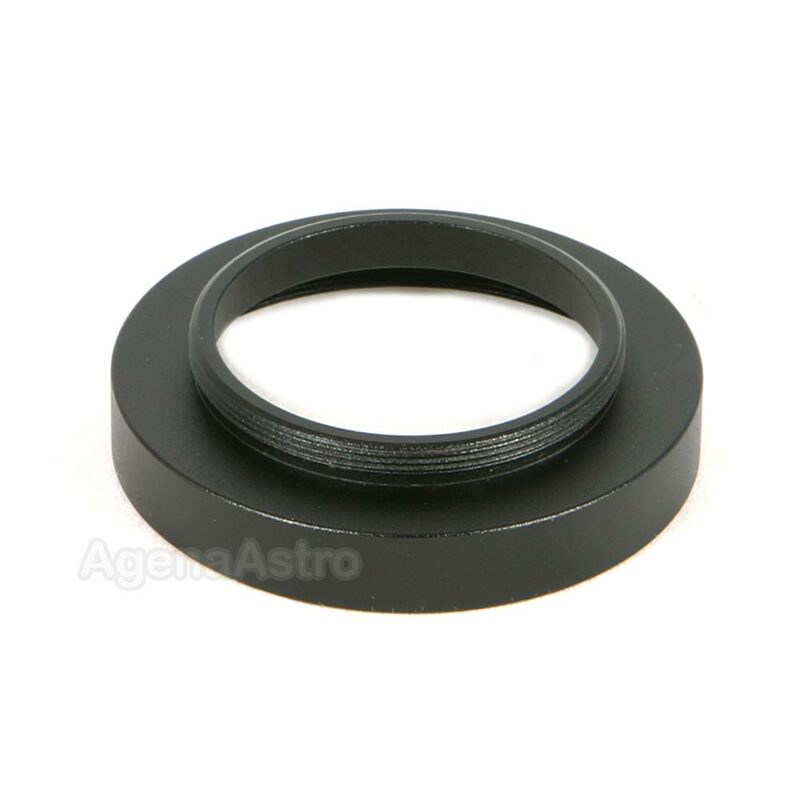 This adapter thus provide an external T-thread (M42x0.75) right at the eyelens of the Hyperion Zoom, which enables the eyepiece to be used with CCD and DSLR cameras for classic eyepiece projection photography. With this adapter, any T-2 extension tubes can be used in-between the eyepiece and camera to project and magnify the image as much as desired. The threaded direct-coupling makes this system extremely rigid and compact. Please note that this adapter cannot be used with the latest Baader MkIII Zoom Eyepiece. Note: Baader refers to this product as HTA54/T-2, SP54/T-2, M54/T-2 or 2958085. They are all one and the same. This adapter screws onto my Baader 36mm Aspheric eyepiece. With the adapter on the eyepiece then will screw into a standard T thread camera adapter. Review by cwd10 of Central Pennsylvania. What can I say? It works. Fit and finish is fine. My only complant is that it's kind of expensive for a simple little piece of machined aluminum.